The writer to the Ephesians also exhorts his hearers to wisdom, in this case, the ability to recognize good from evil. The writer knows the context for encouraging this wisdom: the worshipping community. King David is dead, and he has chosen Solomon, his son with Bathsheba, to be his successor, although Solomon had to fight several of his elder brothers to keep it (the story is told in the remainder of chapter two). Solomon, encountering God in a dream, asks for wisdom and receives it, although verse 14 adds a conditional “if,” which foreshadows things to come. Psalm 111 praises God for the faithful deeds he has done in bringing Israel out of Egypt and into the promised land and blessing them with a covenant. The last verse makes this psalm an appropriate response to our first reading. The figure of Lady Wisdom is important to the ancient Hebrew literature called “Wisdom.” She is understanding and righteousness personified. Here she invites all in need of wisdom (“the simple”) to a festal banquet, a metaphor for learning and following her ways. In the history of Christian interpretation this text has been thought to foreshadow the Eucharist. Indeed, it is the Old Testament reading on Maundy Thursday in the Eastern Church. Overall, Psalm 34 is a song of thanksgiving. The “fear” of God is a much misunderstood concept in the Bible, particularly in the Hebrew Scriptures. There are three elements to this rich term: awe and reverence, the turning from evil, and the choice of obedience to the ways of God. This passage very much echoes the words of Lady Wisdom in Proverbs. but those who seek the Lord lack nothing that is good. The writer to the Ephesians also exhorts his hearers to wisdom, in this case, the ability to recognize good from evil. The writer knows the context for encouraging this wisdom: the worshipping community. Note the paradox: “the days are evil” but give thanks at all times. Such realism and hope are a necessary point/counter-point in the Christian life. 5:15 Be careful then how you live, not as unwise people but as wise, 16 making the most of the time, because the days are evil. 17 So do not be foolish, but understand what the will of the Lord is. 18 Do not get drunk with wine, for that is debauchery; but be filled with the Spirit, 19 as you sing psalms and hymns and spiritual songs among yourselves, singing and making melody to the Lord in your hearts, 20 giving thanks to God the Father at all times and for everything in the name of our Lord Jesus Christ. The Scripture readings (except for the psalm) are from the New Revised Standard Version Bible, copyright © 1989 by the Division of Christian Education of the National Council of Churches of Christ in the U.S.A., and are used by permission. All rights reserved. The Psalm translation is from The Book of Common Prayer. 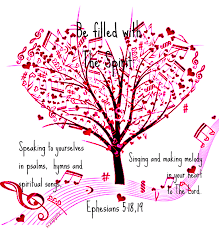 Commentaries are copyright © 2018 Epiphany ESources, 67 E. Main St., Hornell, NY 14843. www.EpiphanyEsources.com. All rights reserved. Permission is given to copy for congregational and personal study use with this attribution. For bulletin inserts using the above, go to our website.